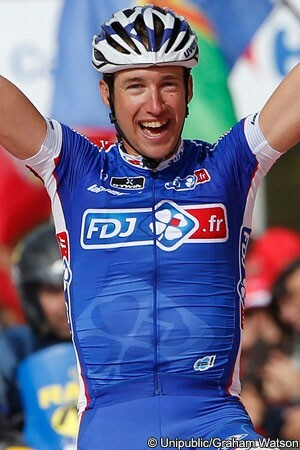 Alexandre Geniez (FDJ.fr) won the 15th stage of the 2013 Vuelta a España, between Andorra and Peyragudes, as the Spanish race paid tribute to the one-hundredth Tour de France. The 25-year-old Frenchman proved to be the strongest of the day’s breakaway, which began with 28 riders on the first climb of the day, then down to just one on the final climb to the finish. Michele Scarponi (Lampre-Merida), who had been part of the original 28-man escape, but not one of the six riders that had broken clear of it on the second climb of the day, took second place, 3’03” behind Geniez, with Nicolas Roche (Saxo-Tinkoff) taking third, another four seconds back, having escaped the group of general classification riders. Red jersey Vincenzo Nibali (Astana) took fourth place, at the head of a small group of contenders, just 13 seconds behind Roche, having held his overall lead intact. “My first pro win was at the 2011 Tour of Austria,” Geniez explained afterwards. “It happened in similar conditions as today. Winning the queen stage of the Vuelta is something exceptional for me. I’d like to win more often but we, as climbers, don’t have as many opportunities as the sprinters. It’s great. I’ll remember this moment all of my life. “Firstly I wanted to position myself at the front for being useful to [team leader] Thibaut Pinot in case of the group of the favourites would come across,” he continued. “But thirty riders never form a very organised peloton. I wanted to go as far as I could and only keep motivated riders with me. I didn’t want anybody who was saving energy for later. The group of 28-riders got away from the peloton on the climb of the Puerto del Cantó, but Geniez escaped it, along with Mikael Cherel (AG2R La Mondiale), Warren Barguil (Argos-Shimano), Francis De Greef (Lotto-Belisol), Andre Cardoso (Caja Rural-Seguros RGA) and Nicolas Edet (Cofidis) on the Puerto de la Bonaigua climb soon afterwards. Geniez pulled away from this smaller break on the steep Port de Balès climb, along with Cardoso, but then left the Spanish rider behind on the fast descent that followed. Roche attacked on the top of the Port de Balès, and was paced towards the final climb by teammates that had been part of the breakaway. With the general classification riders marking one another on the final climb, Geniez was able to stay away all the way to the finish to take his first ever Grand Tour stage victory. Scarponi took second place, having passed the rest of Geniez’ counterattack group, with Roche just a few seconds behind him. After an earlier group had been closed down by Nibali’s Astana team, Bartosz Huzarski (NetApp-Endura) attacked after 23km, on the 1st category Puerto del Cantó, and was joined by 27 others. With David Arroyo (Caja Rural-Seguros RGA) the best-placed in the group, 11’14” behind Nibali in 12th place, this group was allowed to get away, and it was 2’04” ahead of the peloton as Edet took the points over the top after 31.4km. With the gap barely widening, however, Cherel, Barguil, Geniez and De Greef attacked on the next climb, the 1st category Puerto de la Bonaigua. They were joined by Cardoso and Edet and, as Edet took the points again over the top after 101km, the six-man group was 2’27” ahead of the 19 remaining members of the original group, while the peloton was now 6’40” behind. De Greef took the intermediate sprint, in Bossòst, 2’55” ahead of the rest of the break, but the peloton had closed to just 5’30”. This lead had been reduced to 4’40” by the time they hit the foot of the Port de Balès with 48km to go, with the chase group dropping back to 3’30” behind. Geniez and Cardoso left the others behind on the early slopes of the steep climb. Cherel and De Greef tried to chase alone, while Geniez and Barguil were joined by Scarponi, Arroyo, José Herrada (Movistar), Giampaolo Caruso (Katusha) Juanma Garate (Belkin) and Rafal Majka (Saxo-Tinkoff) from the original breakaway. Approaching the summit Cherel was 48 seconds behind the two leaders, with De Greef at 1’30” and the chase group at 2’14”. Chris Anker Sørensen (Saxo-Tinkoff) was now leading the shrinking peloton, 5’18” behind, with team leader Roche poised to attack on his wheel. With the peloton around three kilometres from the top Roche attacked, and there was little reaction to the Irishman’s move. Cardoso led over the top, but Geniez left the Spaniard behind on the descent, unclipping his foot on some of the early, sharp corners. Roche was 4’47” behind the leaders over the top, and caught teammate Oliver Zaugg - who was dropping back from the breakaway - shortly afterwards. The peloton was at 5’08”, just 21 seconds behind the Saxo-Tinkoff duo, but the two teammates began to widen that gap as they took the descent together. Thibaut Pinot (FDJ.fr) and Igor Antón (Euskaltel-Euskadi) briefly pulled ahead on the descent, with the young Frenchman apparently not suffering from the descending problems that he was reportedly plagued by in the Tour de France. As Geniez began the climb to the Col de Peyresourde he was 1’20” clear of Cardoso, while Roche and Zaugg - more than five minutes behind him - were 1’08” ahead of the peloton. The two Saxo-Tinkoff riders were cutting their way through the riders that had been part of the 28-man break, but making little progress on Geniez at that point. With 13km Dani Moreno (Katusha) began the hostilities in the red jersey group, and his move was countered by Alejandro Valverde (Movistar). Nibali then made a move himself, with second place Chris Horner (RadioShack-Leopard) on his wheel almost running in to the near-stationary Zaugg as he had handed Roche over to teammate Majka, who had dropped back from the break. Pinot then accelerated, thinning the group further, until it was reduced to just Nibali, Horner and teammate Robert Kiserlovski, Valverde, Pinot, Joaquim Rodríguez (Katusha), Samuel Sánchez (Euskaltel-Euskadi), Rigoberto Urán (Team Sky), Domenico Pozzovivo (AG2R La Mondiale) and Leopold König (NetApp-Endura). Sánchez attacked across to teammate Mikel Landa - yet another who was coming back from the breakaway - but Rodríguez attacked over the top. Nibali followed, with Horner in tow, the rest followed, but they were edging their was back up towards Roche and Majka; at the nine kilometre banner the red jersey group was just 31 seconds behind the two teammates. Geniez was almost two kilometres ahead of them up the road, still more than five minutes clear. Kiserlovski then took over the pace for team captain Horner, edging even closer to Roche and Majka. Geniez had crested the Peyresourde, however, and was now speeding down the brief descent that came before the final climb to the line. With 3.9km to go, Geniez turned off the main road and onto the climb to the finish. Kiserlovski’s pace saw Sánchez and König left behind, but both made it back on the descent that followed shortly afterwards. Sánchez promptly attacked as soon as the red jersey group hit the climb and the others let him go. Horner then hit the front, pulling Valverde, Nibali, Rodríguez and Pozzovivo away from the others, then Nibali took over with two kilometres to go, and accelerated under the flamme rouge. Up ahead Geniez was rounding the final corners, however, and raised both hands in the air as he took his biggest ever victory. Scarponi was the last of the rest of the break, and crossed the line 3’03” later, just four seconds ahead of Roche. The Irishman had held off the chase, but was just 13 seconds ahead of the others as Nibali took the sprint behind him.